Launch the Exchange Management Console (EMC) on an Exchange 2007 server. 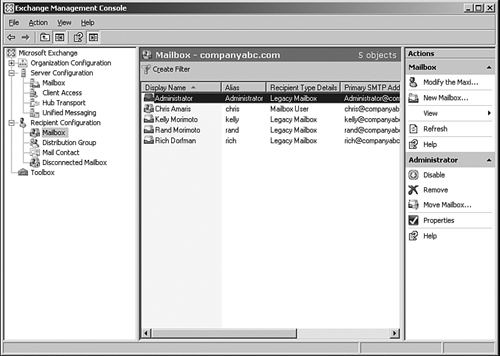 Expand the recipient configuration, and click on the mailbox container. You will see a list of mailboxes similar to the one shown in Figure 5. In the Recipient Type Details column, you will notice some of the mailboxes are flagged as Legacy Mailbox and some of the mailboxes are flagged as Mailbox User. Those flagged as Legacy Mailbox are still on Exchange 2000 or 2003 and need to be migrated to Exchange 2007. Those mailboxes already on Exchange 2007 are flagged as Mailbox User. Figure 5. Mailboxes in Exchange—some are legacy mailboxes, and some are already migrated. Click on a mailbox, or alternately hold down the Shift key and select a group of mailboxes, or hold down the Ctrl key and click on specific mailboxes that you want to migrate. Click on the Move Mailbox action in the right column. 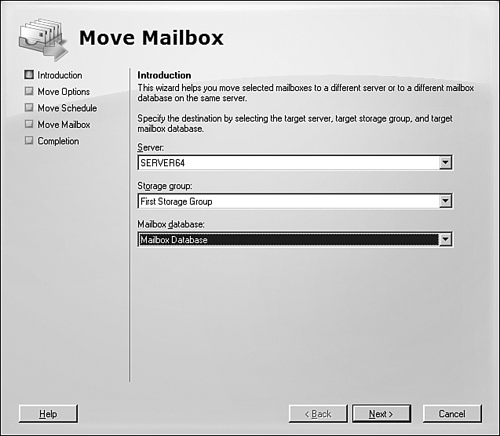 A Move Mailbox Wizard appears and you are prompted with the option of choosing which server, storage group, and mailbox database you want to move the mailbox to, as shown in Figure 6. Choose the destination of the mailbox(es), and then click Next. Figure 6. Choosing the Exchange Server 2007 destination server for mailbox moves. You are prompted with a Move Options screen to choose to Skip the Mailbox or to Skip the Corrupted Messages if corrupted messages are found during the move process. Usually, you would want to choose to skip the corrupt messages so you can complete the migration; however, if you want to problem-solve the corrupt messages, you can skip the migration of the mailbox, and then debug the mailbox problem and try the migration of the mailbox later. Click Next to continue. The next screen is to choose to select a Move Schedule. You can choose to move the mailboxes immediately, or choose to launch the migration of the mailboxes at a later time. Some administrators set up the movement of mailboxes during the day, and then choose a time later in the evening for the mailbox migration to automatically kick off when everyone is off the network. Click Next to continue. A summary screen is shown that summarizes the choices made. 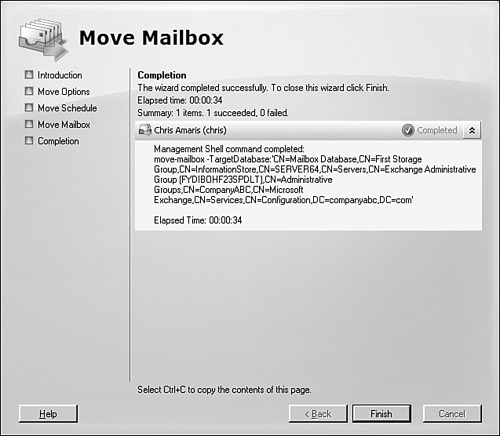 Review the source and destination of the mailboxes that will be moved, and either click Back and make any desired changes, or click Move to begin the movement of mailboxes to the Exchange 2007 environment. The move time will vary based on the amount of data to be moved, and the bandwidth between the source and destination server. This is something that should be tested in the lab to determine whether all of the mailboxes desired to be moved at any one time can be accomplished in the time available. Organizations with a lot of data to move choose to install gigabit Ethernet adapters in servers and place systems on the same subnet to efficiently move large sets of data. This is also something to ensure if mirrored in the test environment as some organizations test the movement of mail on an isolated gigabit test lab switch with fast results, and then when performing the real migration, are working across a slower WAN backbone with very slow performance speeds. After the Move Mailbox Wizard opens the source, opens the destination, and successfully moves the chosen mailboxes, a summary screen of the completed actions appears, as shown in Figure 7. Click Finish. Figure 7. Summary of completed Exchange mailbox move. Even after the Exchange mailboxes have been successfully moved from the old Exchange 2000 or 2003 server(s) to the new Exchange 2007 server(s), keep the old Exchange 2000 or 2003 servers running on the network for typically 2 weeks. The reason is that in Outlook 97, 2000, XP, and 2003, the Outlook profile on each user’s system is keyed to a server, in this case the old Exchange 2000 or 2003 server. If you remove the old server immediately after the mailboxes are moved, the next time the users launch Outlook, their profiles will look for the old server, not find the server, and the users will not have access to email. You will need to go to each user’s Outlook profile and enter in the name of the new server so that the Outlook client will be able to find the new Mailbox server where the user’s mailbox contents are stored. However, if you leave the old server running, when the user launches Outlook, the Outlook profile connects the user to the old Exchange 2000 or 2003 server. The old server tells the Outlook client that the user’s mailbox has been moved to a new server and the user’s profile is automatically updated on each user’s client system to now find the user’s mailbox on the new server. When this is done once for each user, it never needs to be done again. The user’s Outlook client profile is set to find the user’s mailbox on the new server. The idea of leaving the old server running for 2 weeks is usually within a couple of weeks, all users will have launched Outlook once and their profile will automatically change. If a user had not launched Outlook in the 2-week timeframe that you had the old server running, such as the individual on maternity leave, on a sabbatical, or on an extended leave of absence, you will need to go back to the user’s system and manually change the user’s Outlook profile to connect the user to the new Exchange 2007 server. This will likely be done for a very limited number of users. Obviously, the old Exchange 2000 or 2003 server can remain on for a very long time with no mailboxes on the system, but merely be there to redirect users to the new system. However, it is usually recommended to remove the old server just so that objects can be removed from Exchange and the organization doesn’t have to patch, maintain, and manage a server in the environment beyond a reasonable operating timeframe.